Bro. Siga Animation Centre is an NGO in Chennai working toward the empowerment of slum and rural poor. They mainly work with children and their communities at Vyasarpadi an area in North Chennai which is primarily inhabited by people belonging to the lower economic strata of society. BSAC believes that its work is aiming at the empowerment of the people to create a self-sustained community. To elevate the living conditions of youth and children in Vyasarpadi, and highly inspired by Bro. Sigamani, a Salesian priest, a group of young men founded this NGO in 1984. Message from the Secretary & Hon’ Director..
For over 32 years Bro.Siga Animation Cent re (Now aarVam from BSAC) having the privilege of serving as a Non Government Organization working for the uplift of Slum & Rural poor particularly the emerging needs of underprivileged children rights, education and their holistic developments. During the year 2016 I am very happy to express that we have reached more than 5000 children directly through our projects of ‘Reading Skills Enhancement Programme, ‘Child Participation” and Skill buildings programmes. Our experience and focus on meaningful results has shown that the improving the children quality education and holistic developments through Child Participation. My sincere thanks to all our well wishers, especially all those who caring supporters namely 1. ASMAE-France, 2. Chennai Smiles-Sweden, 3.Smile Foundation-New Delhi, 4. Wheels India(CSR), 5. CIOSA-NGO Network, 6. T.N. Slums Clearance Board, 7. AID-India, 8. Bhoomi NGO and other individual philanthropists. 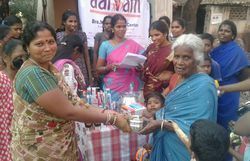 Apart from the regular activities in December 2015 Chennai Flood disaster our organization served for the affected needy people in North Chennai, Vyasarpadi supported the relief materials worth about more than 90 Lacks for 32000 households. My sincere thanks and appreciation to our Staffs without their contribution and commitment it is not possible to reach the organization vision and mission to reach the thousands of underprivileged children and youths. My acknowledgment for our Board Members for their supports and guidance always. My best wishes for the prosperous year 2017 and request your continue supports for protect and promote Child Rights. :No. A-248, B-Kalyanapuram, S. M. Nagar Main Road, Vyasarpadi, Chennai-600039, Tamil Nadu, India.